I took yesterday off because of the heavy rains but I didn’t wait long to get out today. With ice on the roads, I got on my way well before the morning traffic. I didn’t want to have to deal with other drivers that might get in the way of new panfish waters! Having never seen this body of water other than from a far, I knew I would be cutting some serious holes before the day was over. My first stop proved to be the most successful. 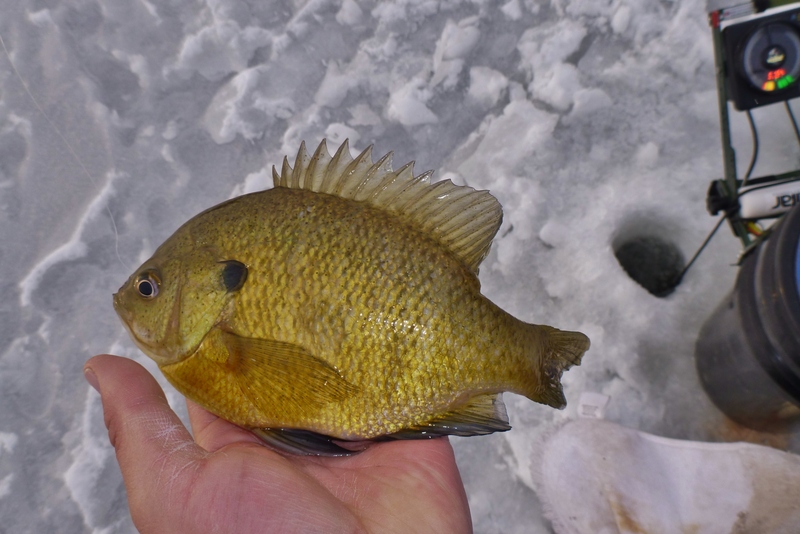 On my first drop I pulled a decent bluegill followed by a dozen others in nearby holes. Not finding anything other that the gills, I decided to push on and keep looking. 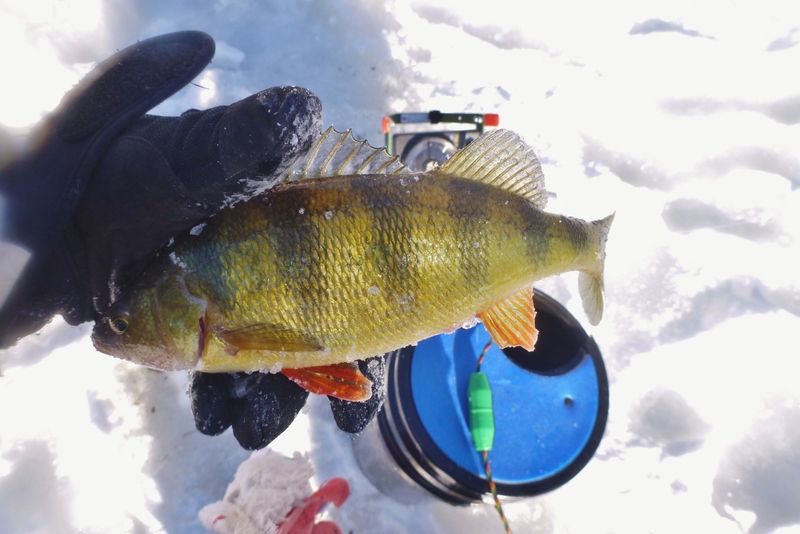 Yellow perch and gills were the only thing that I was able to locate. Much of the water was over 10′ with no weeds. Weeds were the key. As I kept searching, I ended up finding myself on thin ice. When I say thin, I mean going from 8-10″ to 2″. Not to mention it was all white… Not feeling comfortable alone and on a slow bite, I packed it up and headed to a different location that I knew would produce and be safe. The rest of the day was spent pulling mostly crappie with a few gills in the mix. With the extreme cold, I wasn’t able to stick it out until dark and was on the road home shortly after 4. At the second location, the bite was happening but it wasn’t easy. 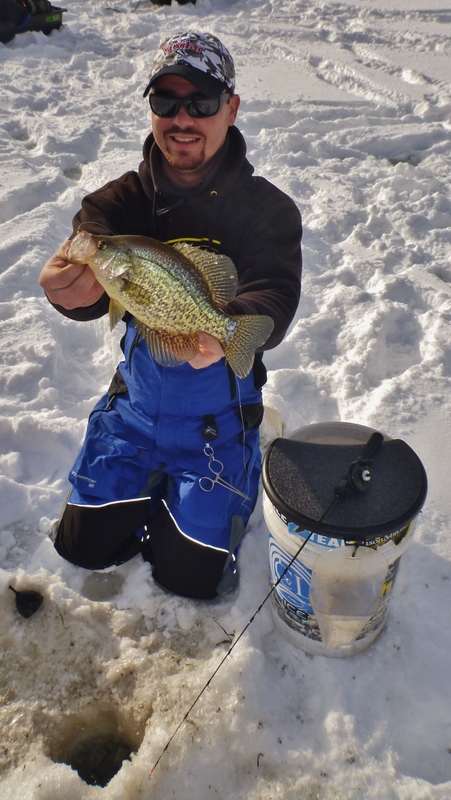 While many fish were below, crappie were the only thing biting. Mainly, the weed edge was the place to be but holes that had short weeds, 6″ or less, were most productive. Working hole to hole, we got on small schools of crappie several times following them until they turned around or hit a break and scattered. Many of the holes that held fish were instantly apparent if any would bite or not. The inactive fish never moved while the rest were charging hard. With the rain/sleet that is coming tomorrow, I will take a day off and catch up on the house work that has been lacking lately! 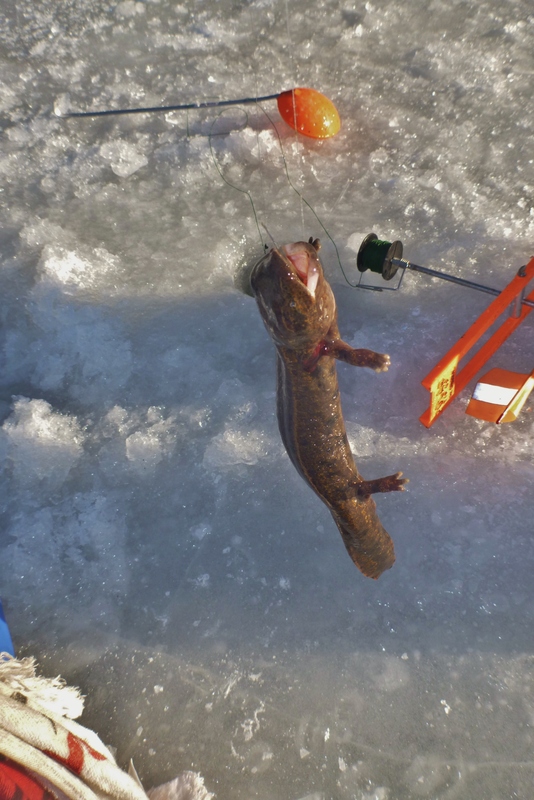 This past Saturday was the opening event for the Vermont Sportsman Hardwater Tournament trail. The event took place at Dillenbach Bay in Alburgh Vermont. If you haven’t had a chance to make it to one of these events I would hope you might soon. Scott Blair and James Vladka are putting on an amazing event for the fishermen of the northeast. The weatherman was calling for poor fishing conditions, 20-30mph winds and rain for most of the day. We made our way off the launch after the checking of our sleds at 6am. Walking through the darkness towards a way-point from the day before we were hopeful the fish were still there. We drilled out our grids and waited for the 6:30 start time. The first hour was slow, we marked very few fish and had to make a decision to stay here or make a move. We knew that we needed a little sunlight to wake the fish up and get them active, so we waited. A little daylight made a huge difference. About an hour into the day we started to notice a little movement on the screens of our Vexilars. Sure enough there were still a few fish in the area from the day before. 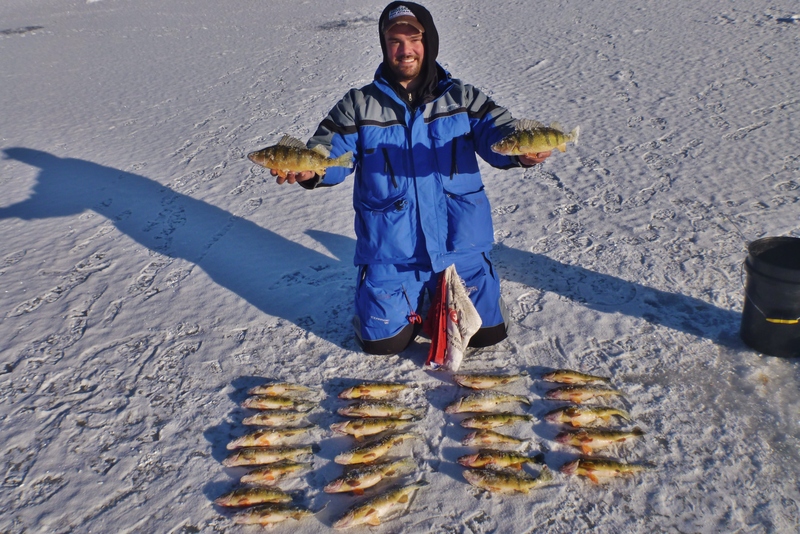 Dylan was able to have a limit of perch and seeds from just one hole. Bobby was struggling a bit until he matched jig color and went to a slightly different color plastic. This made a difference as we both shortly had respectable limits in a few hours time. With fish to weigh in we decided to make a move in search of bigger seeds and perch and hopefully a few crappie. We made a big move and worked in towards shore where nobody had fished. Dylan had seen fish here on the camera the day before and we were thinking they were untouched. We arrived, drilled our grid, and nothing, not a fish in sight. 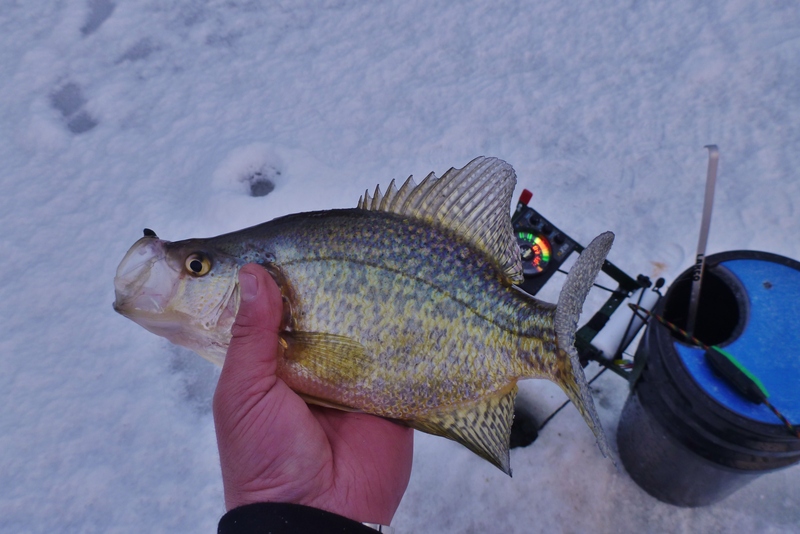 We didn’t waste any time and we went to another spot that held crappies the year before, still nothing. Knowing there were fish around we started working our way back to our initial location hoping to bump into a few. 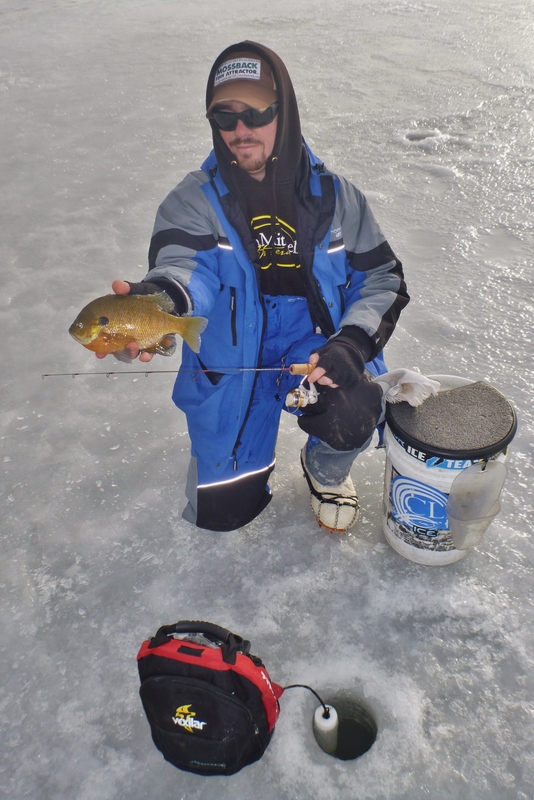 Dylan was the first to find something beneficial and stumbled upon a few jumbo perch, catching one good one that ultimately would be his kicker fish. Bobby had found a few fish about a 100 yards past Dylan’s perch. This is where we would spend the rest of our day picking a fish here and there. 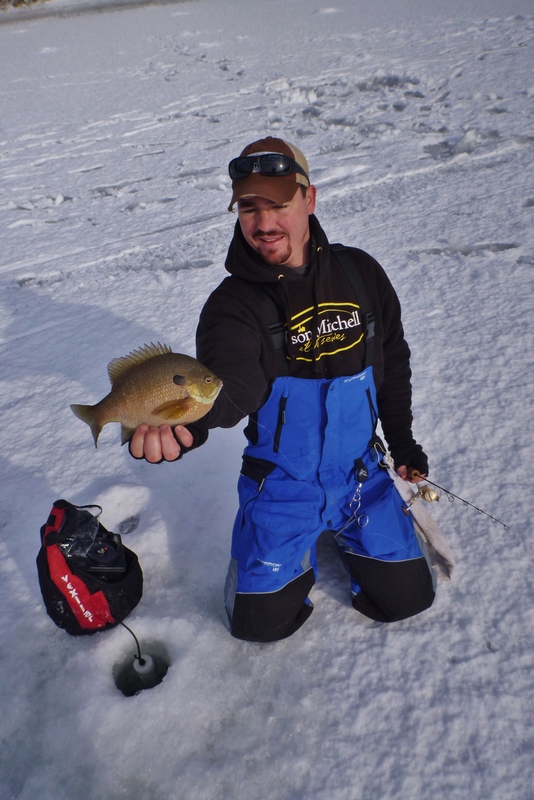 The weather had a major impact on this fish and the fishing. The wind made it near impossible to feel or even see any sort of bite. We really had to rely on our electronics for bite detection. At around 1pm the skies broke open and the rain came down hard. We could tell that the grill was in working order as our noses brought us to shore. Both of us fared well at the weigh-in. Dylan took third place (in the money) with 3.18lbs and Bobby 4th with 2.99 pounds. A good outing for us amongst 49 other fishermen and we hope to keep it up at the next event slotted for January 25th at Larrabees Point. Hope to see you all there. 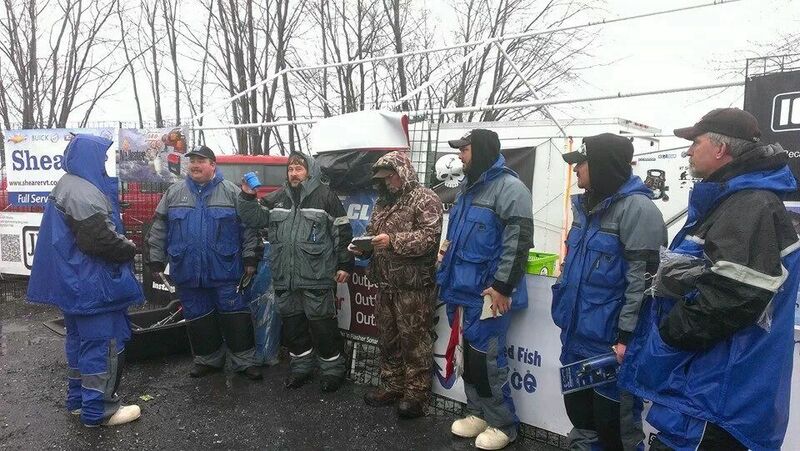 For more information you can check out Vermont Sportsman Hardwater Tournament Series or following them on facebook. 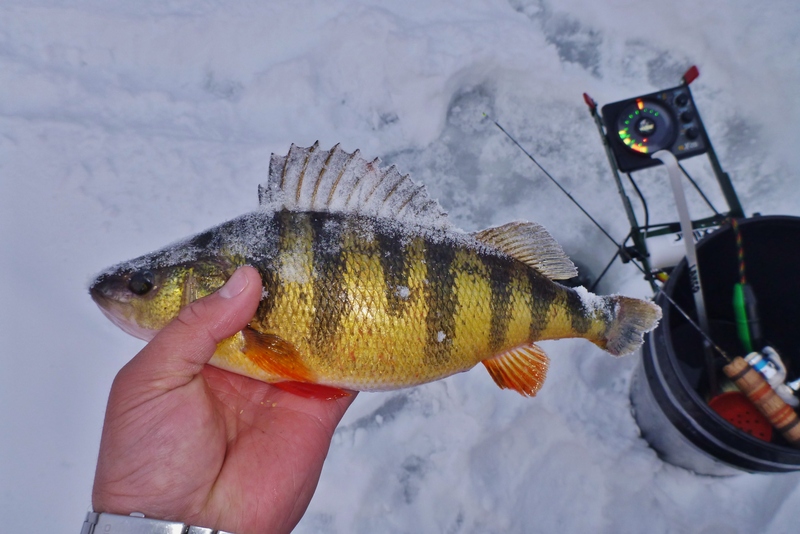 What better way to bring in the new year than with some jumbo perch? Knowing that I had to be to work at 2pm, I needed a bite that was short lived so that I wouldn’t feel obligated to stay all day. Getting on the water around 6 am, the first task was to locate fish. With the jumbos roaming below us in deep water, they could be anywhere in the large lake. We fished for a little over an hour before locating fish. Once we found them though we were able to pretty much sit in a small area and pick at them. The bite was slow for the first 45 minutes but we were catching fish every few minutes. They were holding tight to the bottom and most bites came within 6″ of the mud. As the sun started to rise higher, the fish started to come up off the bottom a little more and became super aggressive. At this point, most of the fish that I was pulling were 3-5′ from the bottom. They were also charging hard. Around 8:30 the bite shut off completely. No fish could be found so we made a move to a different location to get after some bluegill. 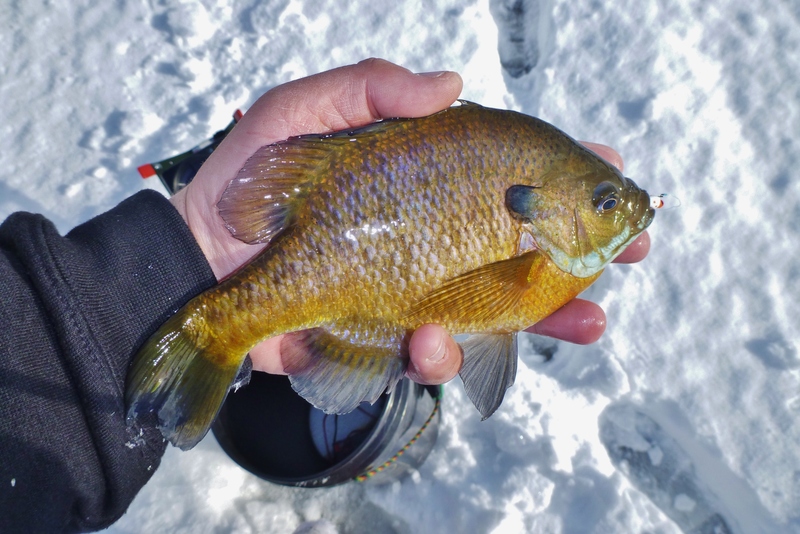 The bluegill were were relating to weeds and were biting well. 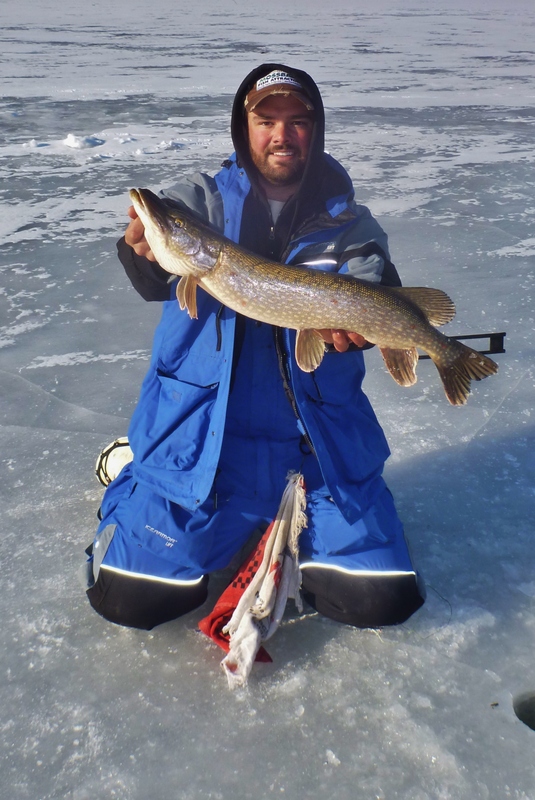 For a few hours leading up until about 12:30, the bite was steady with nice fish on occasion. Knowing work was approaching fast, I loaded my car back up and headed home. While having to go to work was bittersweet, relaxing for a few hours was much needed. I’ll be back out in a few days! We had ample time today for a long trip so we made the most of it. Arriving at what we hoped would be a quality crappie bite, no one was on the water yet. 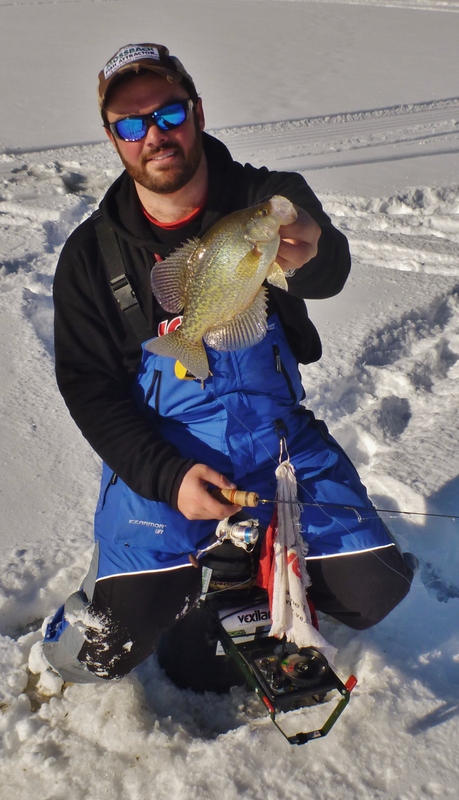 Having the place to ourselves, we punched out a large area over deep water that the crappie usually roam through. The bite wasn’t what we hoped for. We caught quite a few crappie bot not much for quality. 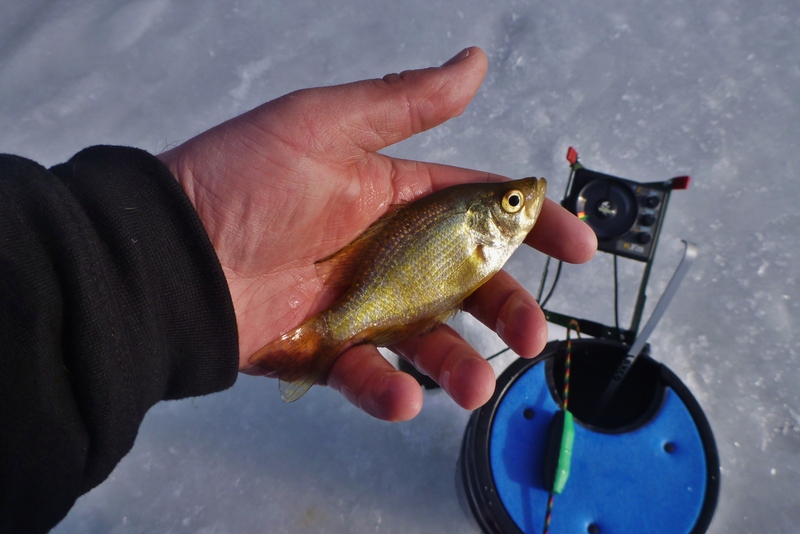 The bluegills on the other hand were stacked. We had to pick through them to weed out the dinks. In the mix with the crappie and bluegill were some perch and bass. 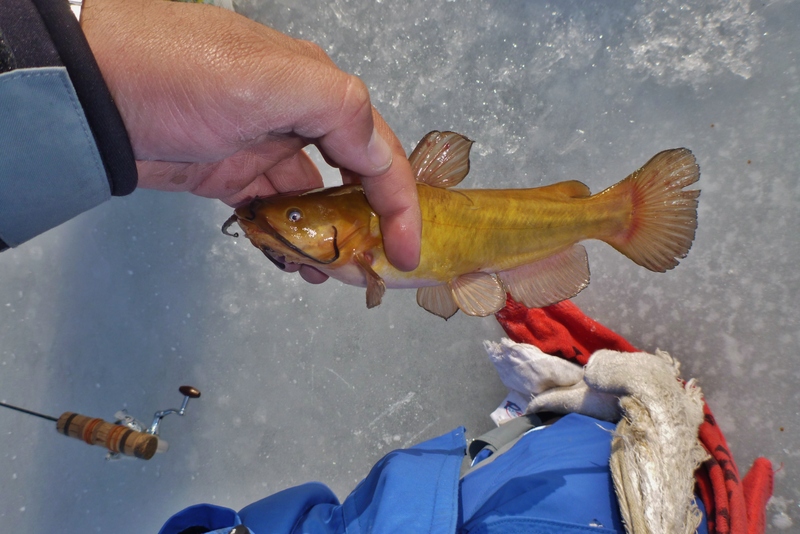 With such a poor bite, we decided to relocate to a place where we knew the fish would bite. We still had plenty of day left to burn and wanted to improve on our results thus far. The move was worth it. While the fish weren’t pounding, the bite was steady with quality fish. 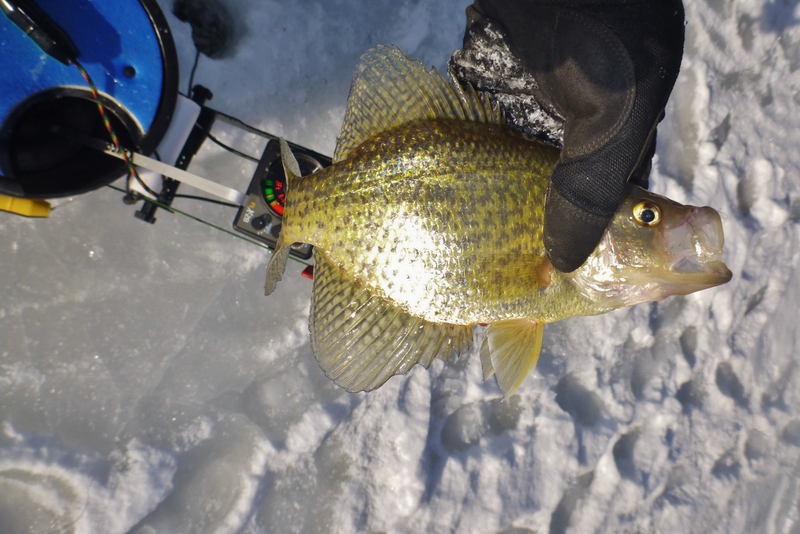 Mainly the crappie were aggressive but there was also a fair number of bluegills that were coming out of their weedy haunts. As the sun started to set, the fishing picked up. I followed the crappie from their weedy day time locations out into short weeds and open water. They were suspending, feeding heavily. Just about every drop a fish would come up and smash my jig before it could get half way down. Sure was a great way to spend the last day of 2013! 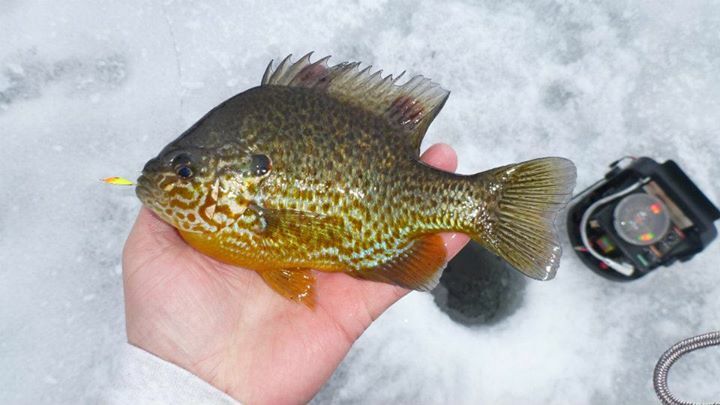 Check out New Years Eve Panfish on our YouTube page for some more action!